Bruce Hagwood found two callings – then merged them into one. 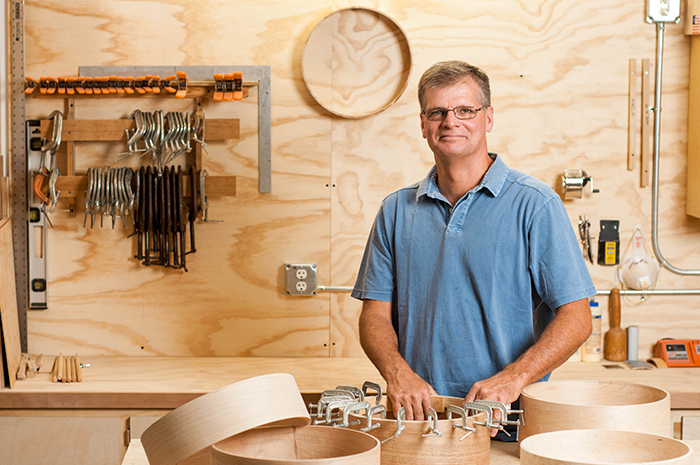 Bruce Hagwood is proud to be a master craftsman, whether you’re talking about playing the drums or making them. The percussionist – Bruce studied at Virginia Commonwealth University under renowned instructor Don Bick in the early eighties. He plays regularly in various groups ranging in styles from jazz to classic rock. Bruce enjoys performing clinics, introducing drums and percussion to elementary students, and generally being an ambassador for music, specifically percussion. The company – Bruce initially founded RBHdrums in 1998. After some success with the company, life seemed to get in the way of high production of drums and the drum production was cut back. The company never went away and careful planning over the past several years has led to the reintroduction of RBHdrums, specifically, RBHdrumsUSA. Bruce’s workshop is located in Virginia Beach, Virginia. 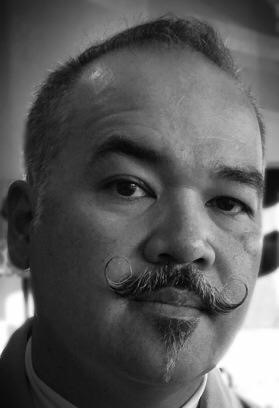 Gary is product specialist for RBH drums. 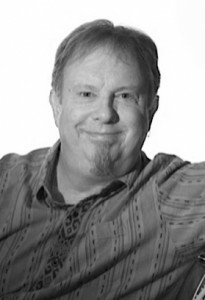 Gary has been involved in the music retail business as well as the manufacturing business for 25 years. Gary started in music retail working for Guitar Center from ’90-’93. He then moved to West LA Music from ’94-’97. Gary was then recruited by DW drums to lead their customer service department from ’97-200. Gary is also an accomplished drummer who drove the Danny Blitz band from ’97-2004, Moonshine Mountain Boys 2005-2007 and is currently holding the drum chair with Shotshell Press. Gary is instrumental in research and development, trade show production, and overall ambassador for RBH drums! Kip Williams was founder and owner of Richmond Music Center; known across the country as one of the premier retail operations in the U.S. In 2000 and in 2005 RMC was nominated for “Best Percussion Store” in the country by Music & Sound Retail Magazine. Kip and his wife Gigi, sold Richmond Music Center in 2007 to pursue his passion for drumming. 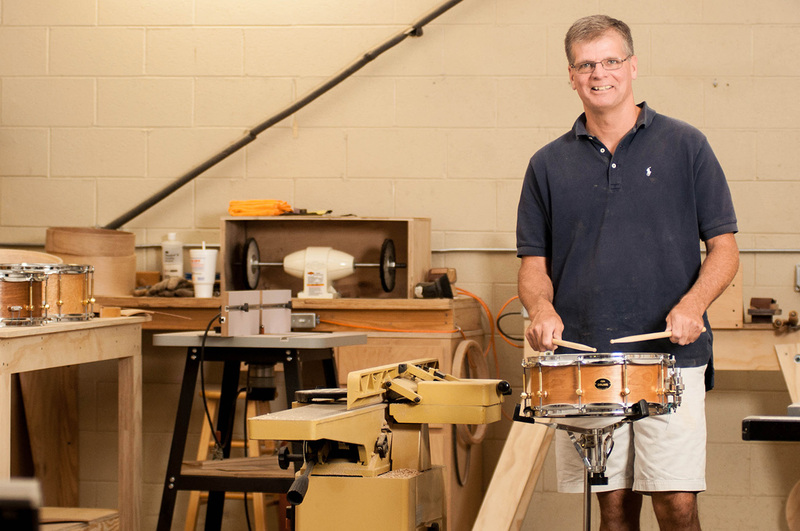 Kip’s extensive knowledge as a drummer, music retailer and entrepreneur as well as his experience in manufacturing, makes him a perfect fit for RBH Drums. Kip Williams has performed and shared the stage with Grammy Nominee James “Saxsmo” Gates, Steve Kessler, Dave Koz, Little Feat, Mike Hawkins (Cyrus Chestnut), Oteil Burbridge (Allman Bros), Jimmy Herring (Greatful Dead, Widespread Panic), Lonnie Liston Smith, Robbin Thompson, Little River Band, 38 Special, Foreigner and was a founding member of the Richmond Jazz Quartet. Kip’s 2010 release “Time” made the Grammy Nomination ballot in 2010 for “Best Instrumental Jazz Album”. In 2011 he traveled to Cuba to study drumset with the Cuban masters. You can catch Kip’s group BopNation currently playing at concerts and Jazz Festivals across the country.